Figure this will be my last chronological posting - afterwards it'll be all over the place. In every sense of the word. 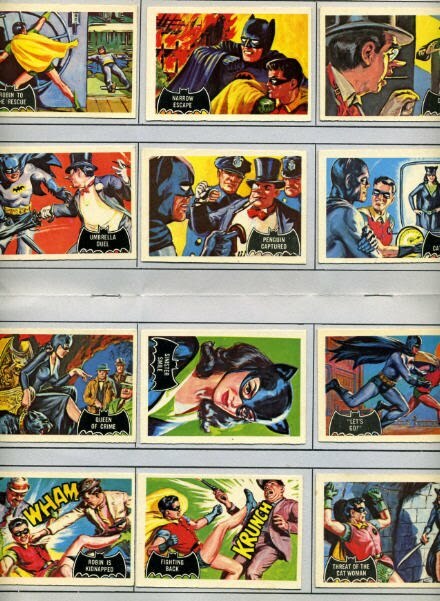 Okay, so there's me having each months Batman comic bought me by my sisters, i'd seen the movie at the cinema but, apart from that, the only other fix i was getting of the Bat were the bubblegum cards from the local shop (don't think my region started showing the show until the early 70's). 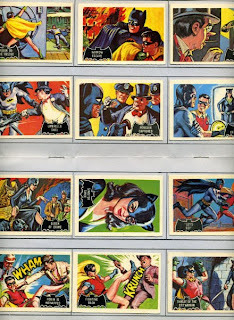 The cards were attractive in that they were easily affordable, they were of Batman, and they had fantastic, almost photo realistic painted art. How did i know the show couldn't possibly live up to what was being depicted on them? Such was my passion for the them that a "friend" called Christopher Deadman, who lived the other side of a busy road from me, would let me have one of his spares each time i'd run from my side of the road to his, if i RAN IN FRONT OF A CAR. Two if it was a near miss. True story and i did it because i wanted the cards so much. Would like to know where he is right now (last i heard, he was done for burgulary). Would be tempted now to make him a dead man for sure.